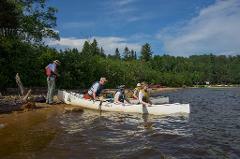 Guided three day canoe trip in Algonquin Park. An excellent choice for beginners, or people on a tight time budget. Equipment, guide, permit, and meals are included. Friday - Sunday. 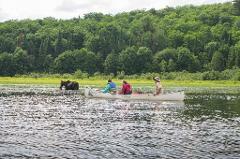 Guided four day canoe trip in Algonquin Park. Explore Algonquin a little deeper! Equipment, guide, permit, and meals are included. Monday - Thursday. 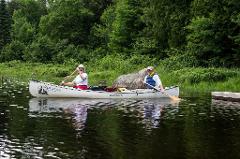 A five day guided wilderness canoe trip in Algonquin Park. We travel many lakes and portages to get deep into Algonquin Park. This is an "Intermediate" level trip. All equipment, guide, permit, and meals are included. Sunday - Thursday. A combination of cozy Lodge stay and a three day canoe trip. You get three days at the Algonquin Eco-Lodge where you can ease yourself into the wilderness, and a three day guided canoe trip where you will be "roughing it". Tuesday - Sunday. 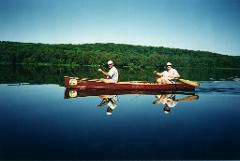 A combination of cozy Lodge stay and a four day canoe trip. You get three days at the Algonquin Eco-Lodge where you can ease yourself into the wilderness, and a four day guided canoe trip where you will be "roughing it". Friday - Thursday.